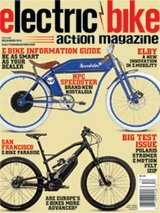 Hi-Power Cycles (HPC) is a company renowned for taking e-bike performance to levels previously unimagined. The batteries for all their bikes are produced locally in Southern California, and whatever platform they produce, there’s no compromise. They make custom bikes for individual customers—from fast cruiser-style bikes to insane off-roaders. Their flagship model is the Revolution. The Revolution M Pro+ is the epitome of that, with a mid-drive that is capable of pumping out up to 3000 watts with a chassis built on an array of top-of-the-line suspension and components. Not content with the original Revolution, designer/builder Chad Loyd reconfigured the original with everything that a pro rider would want. This started with the top-of-the-line suspension from DVO, including a DVO Emerald inverted fork and DVO Jade rear shock. When a customer orders one, the bike is assembled then sent to DVO to factory tune the shock and fork (re-shim, re-valve and tune) to the rider’s weight and the bike’s geometry for optimal performance, just like they’d do for a factory pro rider. As you would expect, everything about the M Pro+ is chosen first and foremost for its quality spec. The bike is customized to the individual customer, including color, battery capacity and motor power—from 1500 watts to 3000 watts. It’s a heavy bike, but to put this bike’s weight in perspective, a decade ago the original Zero motorcycle came out and it weighed 140 pounds, had less travel and was more expensive. And, that bike had no pedals, so if you ran out of battery power, you had to push it home or get someone to pick you up. Speaking of battery, there are choices on the 72-volt battery capacity—from 1800 Wh to 2400 Wh (all batteries are built in Southern California to HPC’s specifications). The battery design has been revamped to fit better inside the frame in this new generation of the Revolution. The 27.5×2.8-plus-inch tires are a new thing for the Revolution platform. The wheels are Spank Oozy Trail 395+ 27.5-inch by 3.95mm width, hand-laced by Loyd himself. This is another part of the reason why each bike carries his signature on the frame. The Renthal carbon handlebars provided fantastic stiffness thanks to layering the carbon fiber just the right way. They were so light that you could imagine them floating away if you took them out of the clamp. They’re a very wide 780mm to offer outstanding steering control. German component-maker Magura figures prominently on the bike—from the front and rear MT7 quad-piston hydraulic disc brakes to the wireless Vyron dropper post. Let’s face it, at this price point you could just as easily buy any top-line off-road motorcycle you could think of—albeit one that weighs about 150 pounds more. The important thing to remember about the HPC is that, like an off-road motorcycle, it is not legal to ride anywhere but on private land or OHV trails. This is not a bike intended for the mountain biking crowd. Instead, it’s for people who love the thrill of riding something more powerful, faster and, still, incredibly quiet. With the DVO suspension, there’s just about nothing it can’t handle—from massive drops and jumps to really rocky terrain. This is a big bike. It feels like it’s the middle ground between a bicycle and a motorcycle. It’s nowhere near as heavy as a motorcycle, but it’s a notch above (almost twice as much) most full-suspension electric mountain bikes for sure. There’s a toggle switch on the right side near the throttle, designated low, medium and high. That affects the motor output and speed ramp. In the low mode, full throttle gives you 50-percent power, making modulation very easy. In high, throttle response is rapid and goes to 100 percent at the top end. While in high, we noticed that you’d get unexpected throttle response easily when your thumb merely touched the throttle. Not an issue if you’re sitting on the bike, but if you’re trying to move it around when off the bike, it can take off. HPC has spent a lot of time working on programming the throttle response, and they’ve made sure that it’s not uncontrollable, even in the high setting. Also, the low end has been set up to ramp up slower if you’re in too high of a gear to start up to avoid undue stress on the drivetrain, including the chain and motor. We saw an earlier version break a needle bearing when an inexperienced rider took the bike up a hill in a higher gear. The software has been tweaked to avoid this. We found this current setup to be great. It only has seven speeds, but that’s plenty. Getting going in the lowest gear was easy. At first, we were zipping along at 25 mph off-road, thinking this wasn’t what we expected, but that’s forgetting that the bike has a mid-drive, so shifting to a higher gear makes the bike go faster. It took no time to hit over 40 miles an hour. There’s no cutoff switch for shifts, so you feel how hard a hit the chain takes on hard-throttle shifts, so it might be good to back off a bit for shifting. The KMC chain was selected because it’s designed for the high torque of electric bikes, but even with that, it’s nice to be a touch gentle with it. A word to the wise: because it’s a throttle-controlled mid-driven bike, the front sprocket moves when the throttle or pedals are actuated. We may have forgotten about the throttle/mid-drive on an early ride and it ate the hem of our editor’s pants! This is a powerful bike, no matter which of the power levels the owner selects. A couple of our test riders didn’t care for the half-throttle. There can be some white-knuckle moments on an extreme machine like this, and a solid grasp on the grip is necessary. One rider suggested that a thumb throttle would be a better spec instead. HPC says that about 20 percent of their customers ask for pedal assist, so that is an option. We normally love pedal assist over throttles, but with this bike, the throttle is better. We did pedal to get it started, but the Q factor is quite wide and pedaling can be a bit cumbersome. The suspension is divine. It keeps the bike planted like nothing else, and it’s so supple and forgiving over the gnarliest of terrain, and we were inspired to take it off drops and through sections we normally avoid. It truly feels like a factory pro’s bike. The triple-clamp fork is really beefy. Thankfully, there are rubber stoppers to prevent the forks from slamming into the frame on tight turns, but riders may want pads on the top of the stanchions and/or kneepads while riding, because contact with these is brutal! The HPC’s geometry was really comfortable, with a front triangle that fit all of our riders comfortably. Head tube height and angle made for easy turning without feeling twitchy, and cornering was outstanding. In the air or on the ground, the bike felt well balanced. It’s an improvement over the original Revolution, which used a rear hub drive. We love Magura’s Vyron dropper seatpost, but if you’re used to a wired one, you may find it a bit slow to respond as we did. When you know the trail you’re riding and can anticipate the need to drop the seat a few seconds ahead, it’s great. In general, Bluetooth tech can be a bit slow, but we’ve heard that the next generation of Vyron droppers will be a bit quicker. Our test bike came spec’d with Kenda Havok tires. They’re good tires on a lot of bikes and in many applications, but it seems mismatched on the M Pro+. It needs a more aggressive tread, especially in the rear. HPC says that the final spec may be the Maxxis Minion DHF and/or DHR, which they’re still testing. We got this bike so early that other production spec may change as well. While the bike is a riot to ride, clearly, it’s not for everyone. You need access to motorcycle/OHV trails or private land. The bike won’t work well on motocross tracks. It’s incredible for exploring, big jumps/drops and anyone who wants performance. If you’re going for this bike, we’d highly recommend the 3000-watt motor over any of the lesser ones. You’ll likely regret it if you don’t. The suspension, power, ride quality and overall feel are simply outstanding and a great culmination of HPC’s experience in building high-performance bikes for a specific and discerning rider. Range: 45–100 miles, depending on battery capacity and use.